Business confidence is down in the dumps in the October to December quarter. 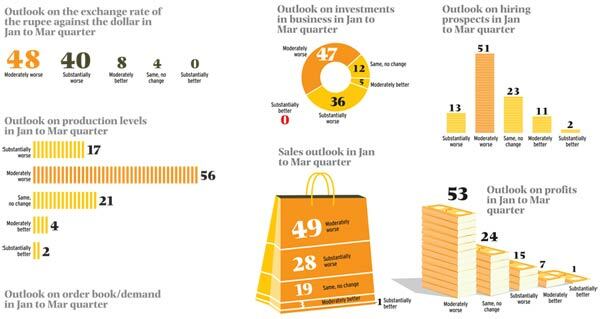 Nor is it likely to improve in the next quarter, show the findings of the fourth Business Today-C fore Business Confidence Survey, which quizzed 500 chief executives and chief financial officers across 12 cities. The Business Confidence Index, or BCI, (see Methodology on how it is done) has fallen to 52.3, on a scale of 100, against 74.8 in the January to March quarter of 2011. All the exuberance of the early months has evaporated. The year itself will not be forgotten in a hurry. It was a time in which India's sweet success story turned sour. Factory output in October contracted for the first time in 28 months, the rupee lost over 20 per cent of its value against the dollar in five months, becoming the worst performing currency in Asia, the stock markets lost one-fourth of their value, and India's growth estimates had to be revised downwards. Prices rose through all of 2011, but the first BT-C fore survey of the year had found businessmen far from perturbed. Since domestic consumption remained strong, it seemed a time of opportunity. "When demand is strong, industry loves inflation. That is the chance to hike prices," R. Seshasayee, then Executive Vice Chairman, Ashok Leyland, had said. But the story did not pan out as expected; instead, businesses found themselves cornered, juggling high input costs, high financing costs, a falling rupee, an unpredictable policy environment and, to top it all, a global economic crisis. While an eight-plus per cent GDP growth for India was once taken for granted, the estimate for the current fiscal year has now been revised to around seven per cent. For financial year 2012/13, global brokerage and investment group CLSA has cut India's growth forecast to 6.7 per cent from its earlier projection of 7.3 per cent. Business has been caught on the back foot. "Corporate houses were not as geared up as they had been in 2008 (when the last crisis occurred)," says Motilal Oswal of Motilal Oswal Securities. "If you keep out infrastructure and real estate, the gearing up was very low." Most companies reported a lower advance tax payout for the October to December quarter, indicating that their margins, and consequently bottom lines, were shrinking. Despite tweaking product sizes and passing on some of the additional costs to consumers, they have had to take a hit. Among respondents to the survey, 75 per cent said their profit margins were either substantially or moderately worse in this quarter than in the one preceding it. "Once the demand for our products exceeded supply by a significant margin," says Chironmoy Chatterjee, Director, Sales, of candy and gum maker Perfetti Van Melle India. "Today the situation has somewhat stabilised. Indeed, it's now difficult for demand to catch up with supply. It's not that easy to sell now." Again, 76 per cent of the respondents said demand was substantially or moderately worse in the October to December quarter compared to the July to September one. Perfetti is now going to schools in parts of rural Bihar, Madhya Pradesh, Rajasthan and Uttar Pradesh in its effort to push sales. 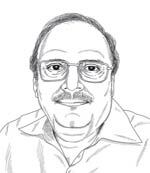 "The biggest challenge is to control input prices," Chatterjee adds. Input costs for the company have gone up by around 30 per cent. The financing costs are also up, with the Reserve Bank of India raising key rates 13 times since March 2010 in its bid to control inflation. "It will be hara-kiri if banks keep raising rates," says S. Vishwanthan, Managing Director of global filter manufacturer, John Fowler India. "Enough damage has been done already." The sharp fall of the rupee to 54.30 in mid-December from 43.85 in end-July delivered another blow. "No one expected it," says Viswanathan. Policy paralysis, with the government mostly engaged in staving off corruption charges, adds to the gloom. Indian companies have little hope of the government taking any bold step to help them out. The recent flipflop over allowing foreign direct investment in multi-brand retail - which the government first said it would permit, only to backtrack in the face of political opposition - has disheartened business heads further. "There are downside risks to growth because of persistently high inflation and the policy paralysis, which not only holds back structural reforms but also hurts sentiments," says Leif Lybecker Eskesen, Chief Economist for India and Asean at HSBC Global Research, Singapore. The sense of despair runs across sectors, even among companies that have so far performed well. Cement maker Madras Cements, the flagship company of the Chennai-based Ramco group, more than doubled its profit in the half year ending September 30, 2011, over the corresponding period the previous year. 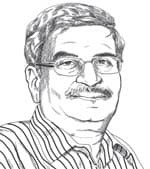 Yet A. V. Dharmakrishnan, Executive Director, Finance, Madras Cements, says: "Typically the cement industry grows at eight to 10 per cent, but today it is growing at just about two per cent. If you look closely, you will find that demand in the South and the East has actually contracted." No doubt the crisis had been awhile in the making. 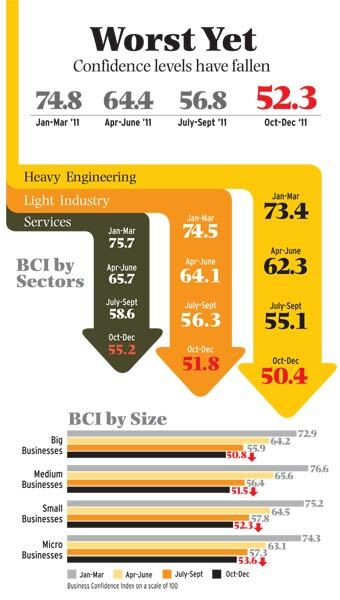 The BT-C fore survey for the July to September quarter had put the BCI index at 56.8, well below that of the first survey. The financials of most Indian companies in this quarter show increased interest costs, rupee depreciation and contracting demand pushing the net profit margins into single digits. The cost of interest for companies such as Sterlite Industries, Ranbaxy Laboratories and Idea Cellular rose nearly 200 per cent. The future appears just as bleak. Nearly 59 per cent of respondents said they expect the availability of finance to get substantially to moderately worse in the first quarter of calender year 2012. Market research agency C fore conducted the survey for the October to December quarter. The field work was carried out in the month of December. A structured questionnaire was administered to CEOs/CFOs of companies. In all, 500 CEOs/CFOs representing various industries in terms of sector and size were interviewed. The survey was conducted in 12 cities - Delhi, Mumbai, Chennai, Hyderabad, Bangalore, Kolkata, Chandigarh, Lucknow, Nagpur, Kochi, Visakhapatnam and Bhubaneswar. The companies were segmented based on their turnover as well as products. Those with a turnover of over Rs 500 crore have been termed as big, those between Rs 100 crore and Rs 500 crore as medium, those with less than Rs 100 crore as small and those with less than Rs 5 crore as micro businesses. The responses to 27 questions pertaining to the present business climate and their expectations for the January to March quarter of 2012 were collated. The average confidence level was calculated on a five-point scale which was further normalised on 100 point scale.